A western run Guest House located in the heart of river side with trusted Cambodian staff who understand the needs of travelers. Our knowledgeable staff can help arrange day trips and onward travel. We are offering clean, safe and comfortable rooms at good value. Double, Twins & triple rooms and large studio style balcony rooms with great river views. All rooms en suite with hot water, fridge, air con, in-room safe, flat screen TV with 70 channels and daily housekeeping. Our centrally location just 50m, from the main river front area saves you money on tuk tuk & taxi rides. 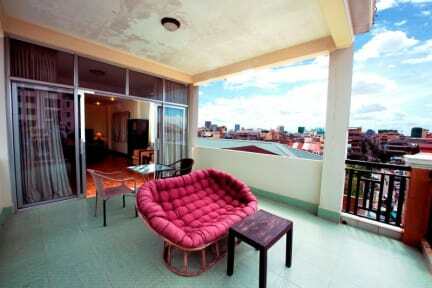 We are within walking distance to many of Phnom Penh's main attractions: E.g. Royal Palace, Silver Pagoda, National Museum, Wat Phnom, Central & Night Market. In the same street as Kandal Market the area has a truly Asian feel, with local Cambodians going about their daily life.